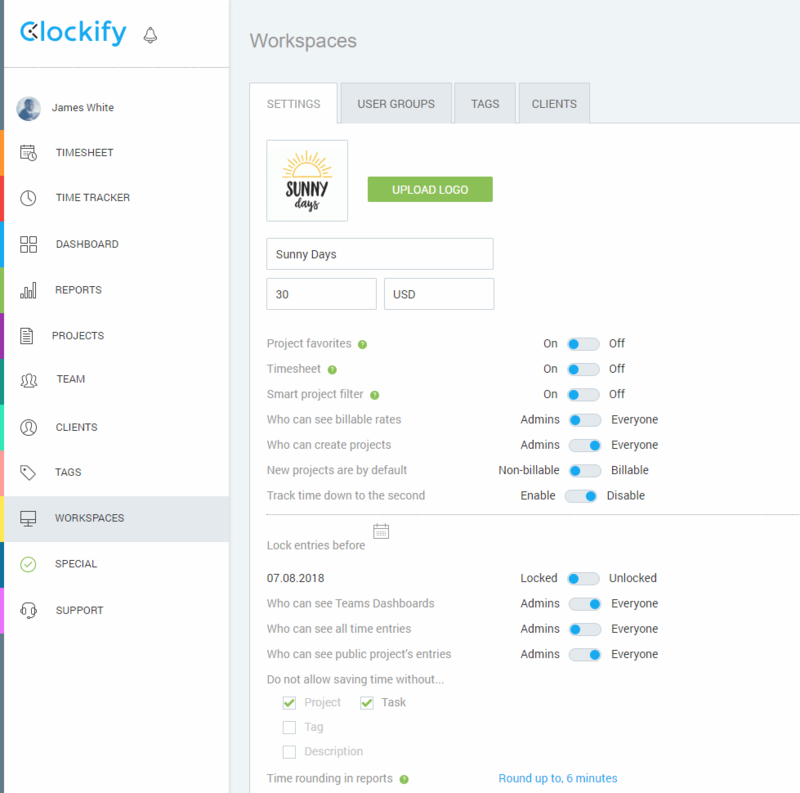 When you first create a Clockify account, you automatically get a workspace. A workspace contains all the time entries, projects, people, and settings. Workspace is the top level segregator, meaning that time entries, teams, clients, and projects are assigned to just one workspace. The only attribute that Workspaces have in common is you as a user. You can create and/or be part of multiple workspaces. 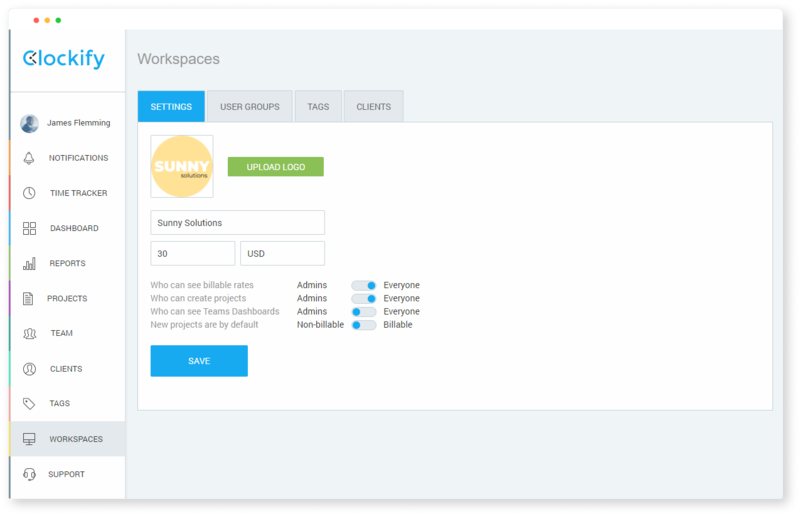 Multiple workspaces are useful when you want to have a separate account for each sub-company or a department. This way, things won’t mix up and you can have different access levels. For example, if you have two companies or departments, you can create two workspaces, and invite different people to each one. Then, you can switch between them as needed. Or, you can a be a team member in one workspace and track time for the company you work for, plus have a personal workspace where you’ll keep track of personal stuff and be admin. Everything in Clockify is tied to a specific workspace, so time entries you made in one workspace aren’t visible in another. Anyone can create a workspace by going to Workspaces and clicking “+ Create new workspace”. When you create a workspace, you are automatically that workspace’s original admin (which means only you can remove people from Admins user group). Learn more who can do what here. If you’re a part of more than one workspace (either as admin or a regular member), you can switch between them anytime you want. Changing the workspace will affect all pages and settings, except User settings (which are the same across workspaces). You can leave a workspace by going to Workspaces and clicking the exit icon that’s next to the Settings button. You can’t leave an Active workspace; to leave, you first have to switch to another workspace. If you leave a workspace where you’re not the owner, to return, someone who’s in that workspace needs to invite you again (and you need to accept the new invite). Owners can’t leave the workspace until they either transfer ownership to someone else or are the only member left in the workspace. If you’re the owner of the workspace (and the only member left) and leave the workspace, the whole workspace will get deleted. All time entries and settings will disappear and this is irreversible. 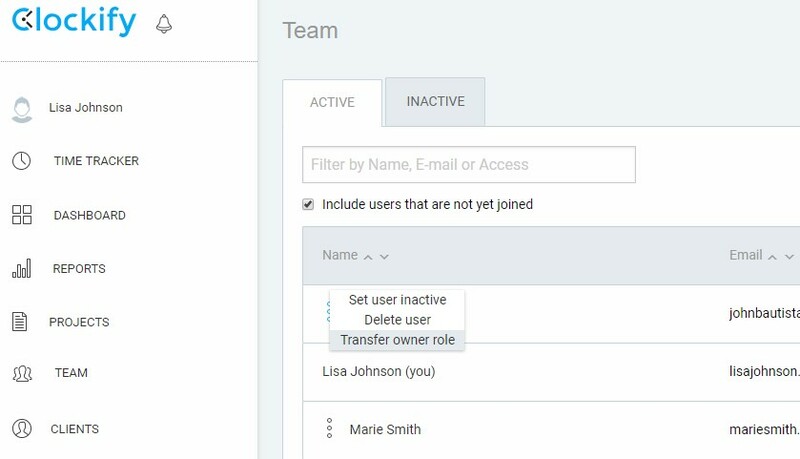 When you transfer the owner’s role, you’ll be downgraded to an admin and no longer be in charge of the workspace. Team member you gave the owner’s role to will receive a notification that you made them the new owner of the workspace. Please note that the only way to get back the ownership of the workspace is if the new owner transfers the role back to you. You can delete your own workspace when you leave it by going to Workspaces and clicking the exit icon that’s next to the Settings button. Since owners can’t leave workspace until they either transfer ownership to someone else or are the only member left in the workspace, to delete the workspace you own you’ll need to remove all team members and then leave the workspace. Please note that you can’t delete a workspace if that’s the only workspace you have. To delete it, you’ll need to create another workspace and make that workspace Active. Then you can delete the other workspace. When the owner of the workspace leaves it, the workspace is deleted automatically, forever. This can’t be reversed. Once a workspace is closed, it can’t be reopened.